This view of the Bullet Cluster, located about 3.8 billion light years from Earth, combines an image from NASA's Chandra X-ray Observatory with optical data from the Hubble Space Telescope and the Magellan telescope in Chile. This cluster, officially known as 1E 0657-56, was formed after the violent collision of two large clusters of galaxies. It has become an extremely popular object for astrophysical research, including studies of the properties of dark matter and the dynamics of million-degree gas. In the latest research, the Bullet Cluster has been used to search for the presence of antimatter leftover from the very early Universe. Antimatter is made up of elementary particles that have the same masses as their corresponding matter counterparts - protons, neutrons and electrons - but the opposite charges and magnetic properties. 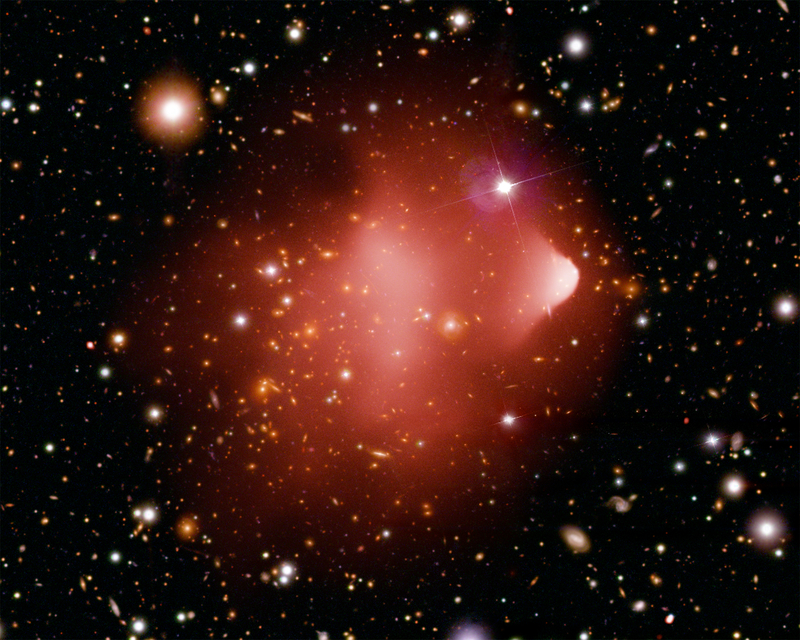 The optical image shows the galaxies in the Bullet Cluster and the X-ray image (red) reveals how much hot gas has collided. If some of the gas from either cluster has particles of antimatter, then there will be annihilation between the matter and antimatter and the X-rays will be accompanied by gamma rays. The observed amount of X-rays from Chandra and the non-detection of gamma rays from NASA's Compton Gamma Ray Observatory show that the antimatter fraction in the Bullet Cluster is less than three parts per million. 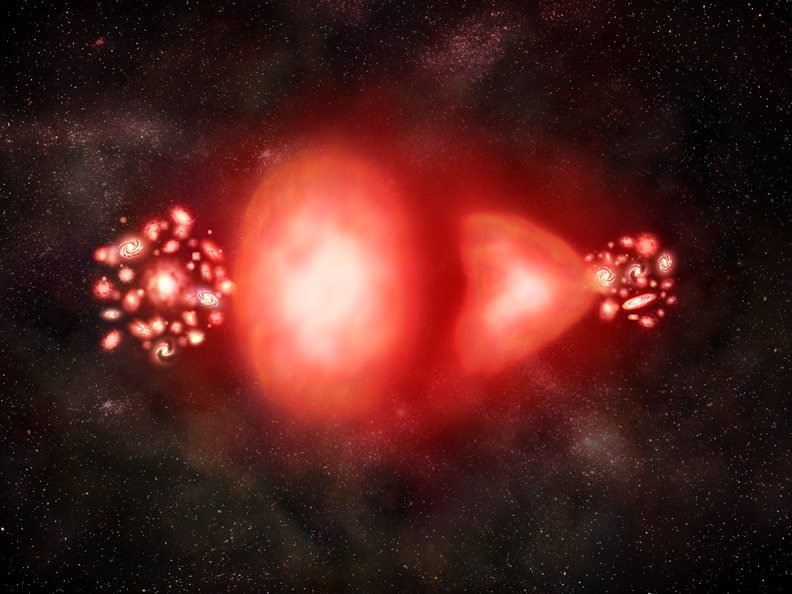 Moreover, simulations of the Bullet Cluster merger show that these results rule out any significant amounts of antimatter over scales of about 65 million light years, an estimate of the original separation of the two colliding clusters. Credit X-ray: NASA/CXC/CfA/M.Markevitch et al. ; Optical: NASA/STScI; Magellan/U.Arizona/D.Clowe et al. Scale Image is 6.7 arcmin across. Good evening. Please can you inform the apparent magnitude of the cluster? Thanks.